Everyone knows that recycling and reusing are good for Mother Earth, but did you know that we have a huge trash problem? Here’s one example: Americans throw away enough recyclable aluminum every year to supply the entire auto industry! Worldwide each year some 500 billion to 1 trillion (!) single-use plastic bags are consumed. Those are your grocery, shopping, and produce bags, primarily, that cannot be recycled. In the case of all those plastic bags, they could simply not be used in the first place. Curious about what can and cannot be recycled, and how to do it? Read this. Here’s the thing. You don’t have to go on a recycling crusade or start a movement to create change. Making a few small changes to go green could really make a difference in your life and for the planet collectively. Charge your smartphone or tablet in airplane mode so the battery charges quicker. Turn off your computer at night. Change your light bulbs to energy efficient bulbs. Wash your laundry on cold instead of hot, and air dry what you can. Do you need three lights on in your bedroom, or can you open a window and turn off two? Get into the habit of shutting off lights and other unnecessary electronics when you leave the room. Find a quality water bottle and get in the habit of keeping it filled with your favorite beverage. 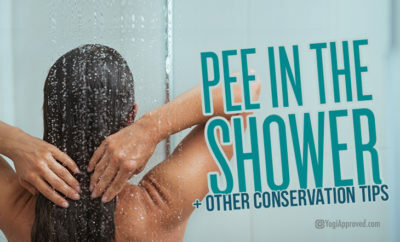 Bring it everywhere so you don’t contribute to the massive waste of cans and plastic bottles. If you want to take this to the next level, bring your travel mug along to the coffee shop – many places even offer discounts for bringing your own mug! Think about ditching the car and walk or ride your bike to work, yoga, or a friend’s house. The exercise will give you more energy throughout the day and it will mean one less car on the road that day. If that isn’t an option, you can also look into public transit (aka bus, light rail, train, etc.) or carpools available in your area. Plant a garden or window box with your favorite veggies and herbs. It doesn’t have to be anything complicated, but gardening can help you spend more time outside and you’ll be able to use what you grow. Also, try making your own compost bin! Coffee grounds make great fertilizer, too, so once you’re done with your morning joe, the grounds can go towards those veggies rather than the trash can. Are you buying products that have been processed and filled with sugar and wrapped up in a lot of packaging? Or are you focusing on the fresh produce, meat, fish, and fresh-baked products? Ready for the next level of green? Check out your local farmer’s market. Don’t forget to bring your own reusable shopping bags, too! Whether that’s once a day, once a week, or a full lifestyle change, consider reducing the amount of meat you consume. Every pound of meat harvested takes thousands of pounds of water (plus emissions) to produce. And while going veggie for one day a week might not seem like a big deal, some say it can have as much impact as driving a hybrid car! Do your spring cleaning (whatever time of the year you like to do it). Donate clothes you don’t wear anymore and books you aren’t going to read or reread. Recycle those old magazines and get in a habit of recycling what you can from your garbage on a regular basis. Most cities make it easy (and free) to recycle, and it’s a responsible alternative to sending all your trash to the dump. 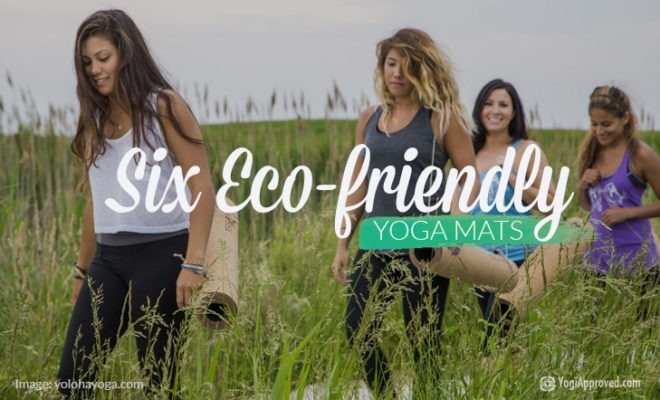 There are more and more awesome 100% eco-friendly yoga mats and clothing on the market like Yoloha yoga mats, or Hottie Yoga Wear for example. 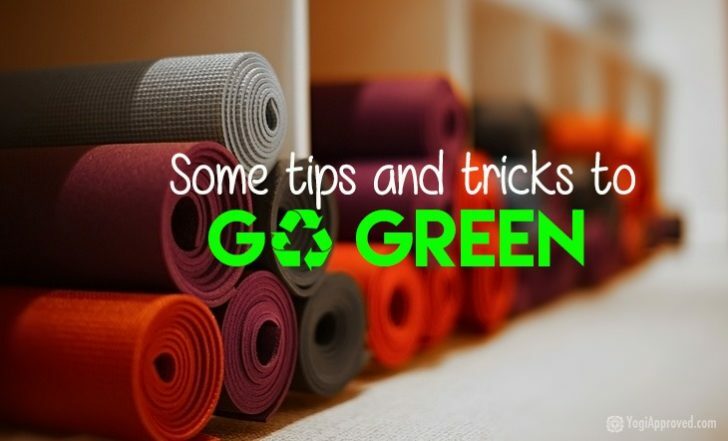 As for your old mat, you can wash it and repurpose it to keep rugs from sliding, or turn it into cabinet and drawer liners, and you can donate or repurpose your old yoga clothes. The possibilities are endless. What are you using and what are you wasting? What can you use less of and what can you switch out for environmentally friendly products? Every little bit helps. If everyone does a little bit (and every little bit counts) we will start cleaning up the world we all live in and depend on. Making a few small changes can lead to some truly great things. The Earth isn’t ours to use up, but rather to care for and preserve. 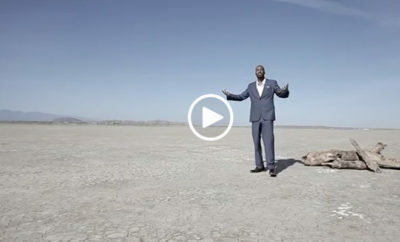 Let’s start showing Mother Earth the love and respect she deserves! This article has been read 951 times. Share it and spread the love! From commuting to class to cleaning your mat afterwards, here are some sustainable yoga products and tips for going green and showing Mother Earth you care!